Noura Construction at Burke Mountain has set out deliver custom homes at affordable prices. Offering unlimited customizations and flexible floorplan options, these homes are a unique opportunity to own a luxury home in the Burke Mountain area. 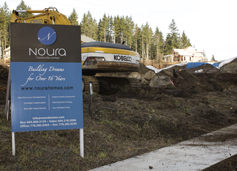 Noura is developing three different sites in the Burke Mountain area. Contact Rebecca for information about available Noura properties.